Leading Manufacturer of ms pistons and ms engine pistons from Ludhiana. Owing to our vast experience in-depth knowledge in the industry, we are offering a well managed MS Pistons. This piston is widely used in all types of engines. Our offered piston is manufactured using the superior quality raw material that is sourced from the reliable vendors of the market. It is widely appreciated by the clients due to its corrosion resistant, compact size, dimensional accuracy and longer service life. 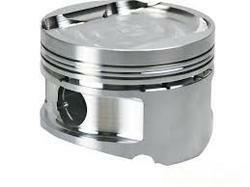 Additionally, we provide this piston in a given time frame at most reasonable prices. Backed by a team of hardworking professionals, we are engaged in manufacturing, trading, exporting and supplying a wide range of MS Engine Pistons. This piston is highly demanded in the automobile industry to provide high strength to the vehicles. Our offered piston is manufactured using the finest quality raw material and newest techniques following the international standards. Our provided piston is tested by our quality controllers to ensure its quality. Keeping in mind the changing needs of the clients it is available in different sizes and dimensions.